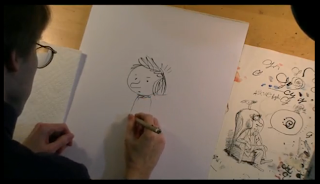 On today's Comic Riffs blog, Washington Post cartoonist and editor Michael Cavna solicits comments on Cul de Sac under the heading Defend That Toon. 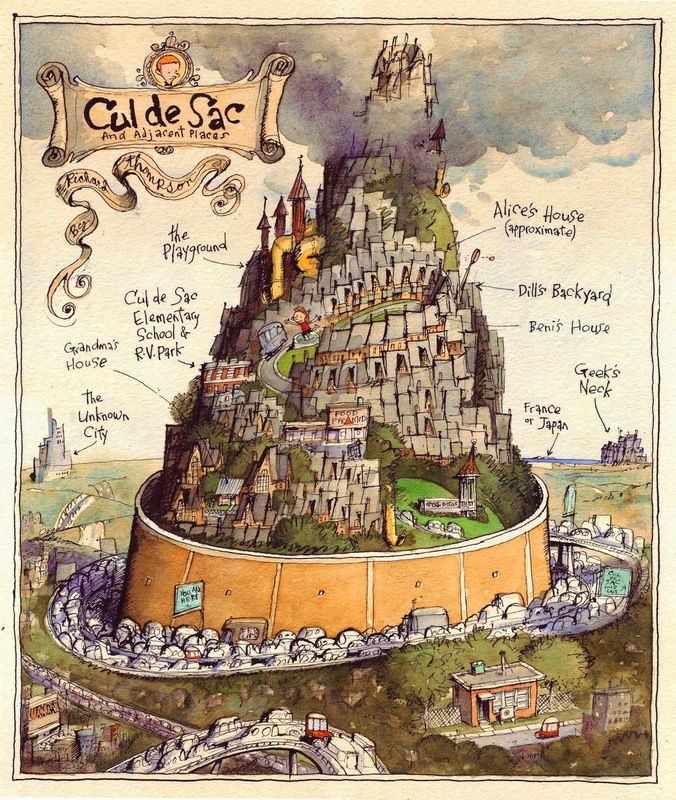 My only comment is, I wish the guy who does Cul de Sac would learn to draw faster. Coming Soon. Wait! It's Already Here! October 2nd! That's Groucho Marx's birthday! 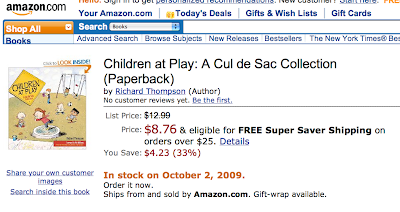 And what better way to celebrate than by ordering multiple copies of Children At Play? UPDATE- It's now available! In fact, it may be already on your shelf at home. I did this for today, Sept 26th, but it didn't make it into the paper because I forgot to tell them I'd have a cartoon for this week until the very last minute. And I'm not exactly disappointed as this was a kind of late substitute for another related idea. Malcolm Gladwell writes a best-seller in under 15 minutes based on an ineffable concept of your choice - $5. Rogue Kindle unfolds into giant robot and destroys all print. The Librarian of Congress whatsisname goes around shushing everybody. But it didn't really go anywhere, and not for the first time either. So here's this Dan Brown thing instead, and it's not even entirely finished . But next week- something else! 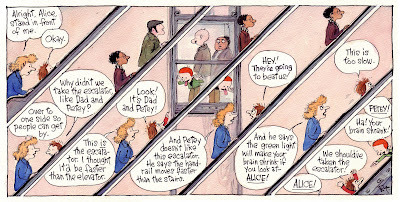 And thanks to Michael Cavna of the Washington Post, whose Comics Riffs blog post cogently explains how the Sunday Cul de Sac has migrated to the Post's Style section. We bid the Washington Post Magazine a fond farewell and thanks for the nurturing, the hospitality and for all the fish! Who's going to SPX 2009? I am, I am! Thanks to the driving skills and good company of the legendary Mike Rhode, I'll be attending as "Press" on Saturday. Anybody else going to be there? Behold the Finnish version. It will soon be translated consecutively into Icelandic, Urdu, Hobbitese, Klingon, a private language spoken by a set of poorly-socialized identical twins living in Kansas, then back into English. 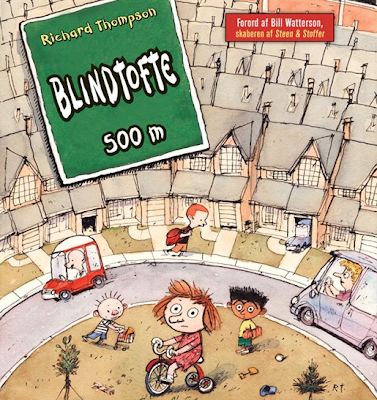 Blindtofte is, of course, Danish for Cul de Sac. At least, I hope it is, because that's what it says real big on the cover of the Danish version of the first book just issued by Carlsen. Who did a lovely job of not just translating but also mimicked my clumsy lettering very nicely too. Unfortunately, this guy didn't care for it much. Several Metro stations around DC have glass elevators next to or between escalators, or vice versa. I get them confused too. This ran in the Post Mag in aught-six. 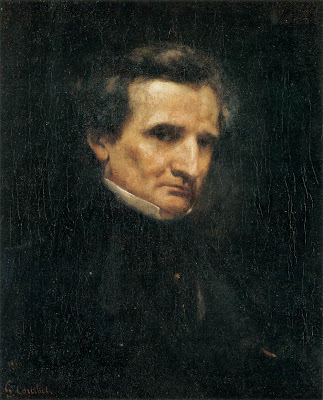 For years I've had a small semi-obsession with Hector Berlioz, the great French Romantic composer who was pretty obsessive himself. I like his music a lot and I like his face almost more. He had a wide, sharp edged face, piercing eyes and an aquiline nose. as you can tell from the painting below by the (great French Romantic) artist Gustave Courbet (and I wonder what they chatted about during the posing sessions, like, which one was the greatest, Frenchest and most Romantic). 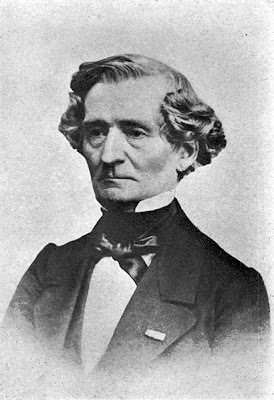 Best of all, Berlioz had this great big crest of brick red hair, one of the great haircuts of the Romantic Period (except for this guy). He had an eventful, triumphant and disappointing life, like most people, at least during the Romantic Period. His music was revolutionary in all kinds of ways and was received with open arms and cold shoulders. A lot of his pieces were kind of hopeful monsters; symphonies that mutate into concertos or oratorios and vice versa, and most of them tell a story. His most famous work, the Symphonie Fantastique, tells a gruesome story of obsessive love spun out of control, and it's always struck me as being like a movie with a silly plot but really eye-popping special effects. Whatever, he just seems like a great guy to draw. Even if, on some days (above), he bears an unfortunate resemblance to Robin Williams. 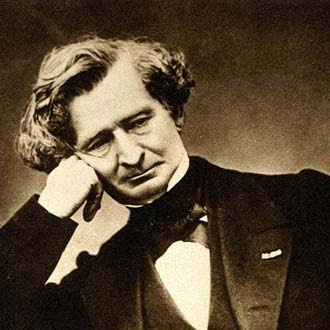 And I'm not the only one to be inspired by Berlioz's face. 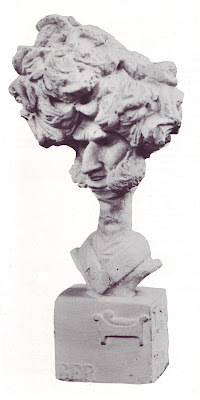 The above caricature is by the great, somewhat-forgotten sculptor Dantan Jeune, who, while no Daumier, nailed some of the great personages of his day. So, you know, lemme at him. 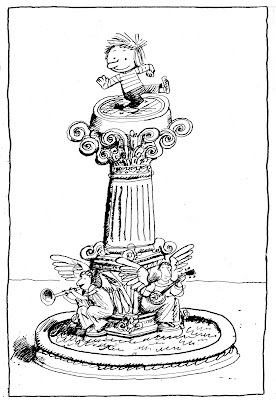 I did this little unthinking sketch some years ago and realized, hey, that's him. I had a frame and mat that was just the right size and color for what I wanted to do; a poster-like caricature with just a few flat, bright colors and a yellow background. 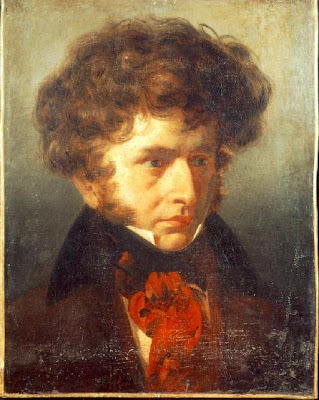 And with his big red crest of hair maybe my Berlioz would look a bit like the Gallic rooster, as a kind of visual pun that nobody would get but me. After way to much fussing, this is what I ended up with. They say works of art are not finished but abandoned. I should've quit while I was ahead, but I never got ahead on this one. I love the hair, it's the best watercolor wash I ever did, 5 or 6 layers of various deep reds and maroons, all without a frisket. But somewhere along the way I got panicky on the face and background. I'd seen some of the splashed, vivid work of the painter Deloss McGraw, so I tried splashing gouache on the background, which might've killed it. I don't know. This has been sitting in a drawer for a couple of years, and I'm not sure if I like it or not. I can't find the frame and mat I had for it, so this isn't going on any wall any time soon. This (above) is pretty close how I'm feeling about it. Which is a lot of emotional baggage for a mere caricature to carry. But like I said, I've got a small semi-obsession. 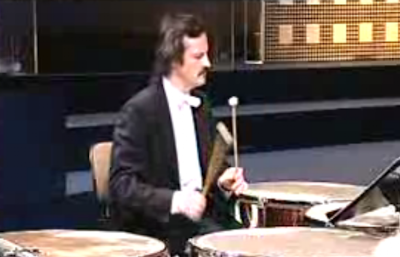 This should help put things in perspective, especially as you'll note, if you watch the whole performance of the Roman Carnival Overture at the link, they've got Basil Fawlty playing tympany. 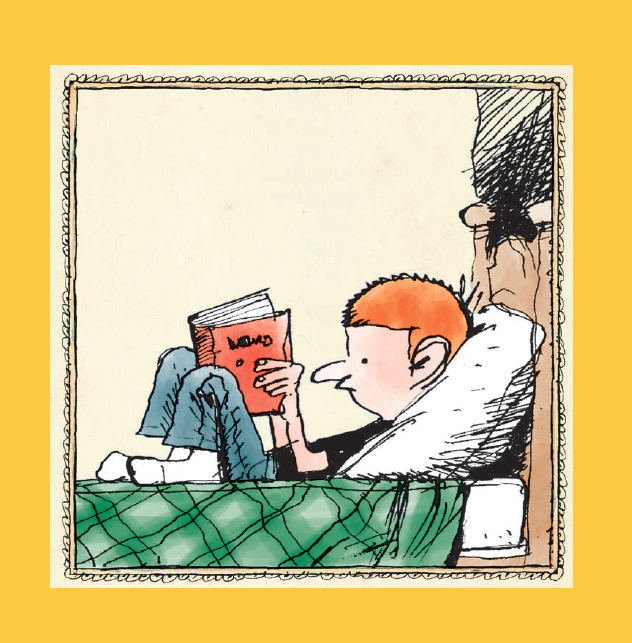 Today is the second anniversary of the launch of Cul de Sac as a daily strip, courtesy of the fine folks at Universal Press. 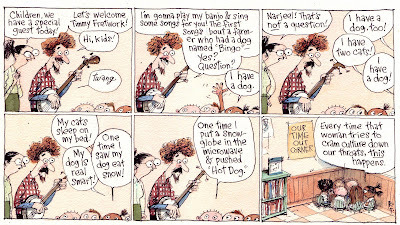 Today's strip reveals that Miss Bliss has become engaged to banjo virtuoso Timmy Fretwork over the summer holiday. 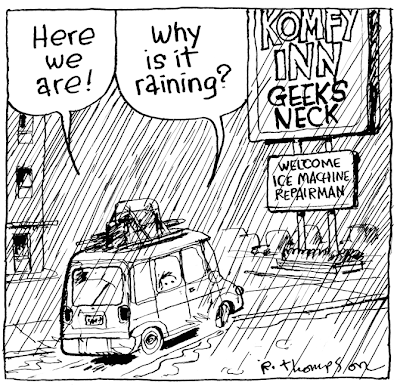 Here's Timmy Fretwork's first appearance from an October '04 Post Magazine, which I redrew three years later for the syndicated strip. Mr. Fretwork is based on about five real people. Everybody loves to draw dragons, and who am I to be an exception? This is the middle panel of today's strip. If I'm drawing a Sunday like this I'll often think of the central image first, then attach panels on either side, so it'll make sense. This is how the triptych painters of the Northern Renaissance did it too, though it sounds an awful lot like the tail wagging the dragon. Like I said, drawing rain is hard, hough this came out OK. 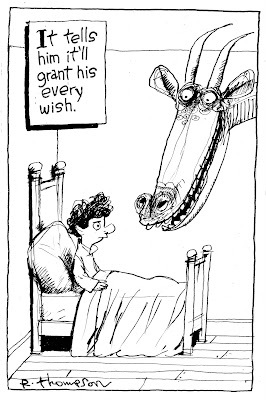 I'm starting to think that naturalism in a comic strip is the refuge of a lazy cartoonist. 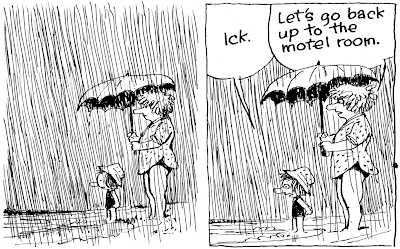 It'd be more interesting if the rain was funnier. I'd hate to be the one they're all staring at, wouldn't you? That's a lot of cynosure to be the object of (if that's right). 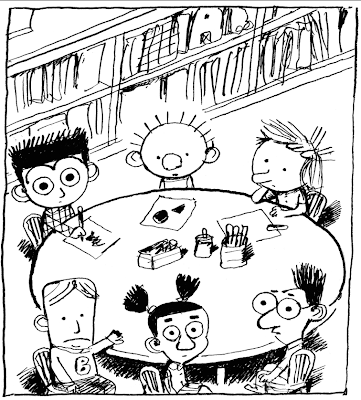 Here's a panel from an upcoming Sunday strip. It's pretty much the whole joke, so Whoops! What a give away! This is for Amy, who said the Welcome sign made her laugh (and was probably too small to see in the paper).